GOTG Vol. 2 Groot and Rocket Ceramic Salt and Pepper Set:Dynamic duo is a moniker normally applied to another superhero team, but it certainly applies to this inseparable pair as well. Ready to season your meals and save the galaxy - again - at the same time, this Guardians of the Galaxy Vol. 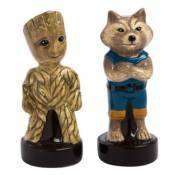 2 Little Groot and Rocket Raccoon Sculpted Ceramic Salt and Pepper Set is sure to get you hooked on a feelin'� feelin' good! Standing about 4-inches tall, Groot and Rocket are custom sculpted and hand painted in terrific detail. They're microwave safe and come in a matching full-colour gift box. Hand wash only. Not dishwasher safe.